More effective and efficient irrigation is required to achieve increasing yield and fruit quality expectations and make best use of limited water resources. Optimal irrigation can be achieved by using a combination of soil moisture monitoring and basic water budgeting techniques. Optimal irrigation can be achieved by using a combination of soil moisture monitoring and basic water budgeting techniques. All too often growers will depend on just one of these tools and compromise yield and fruit size as a consequence. Soil moisture monitoring tells us what is happening at specific locations, but due to variability within the orchard and failure to correctly interpret monitoring results, soil moisture monitoring alone is not enough. Winter is an ideal time to assess whether your irrigation strategy delivered the goods this season or came up short. Australian apple and pear growers can easily analyse their irrigation strategy by recording rainfall, evapotranspiration and irrigation in OrchardNet®, which is available through the Future Orchards® program to Australian growers. A basic water budget can be easily calculated, and along with soil moisture monitoring, provides a useful cross reference to ensure that irrigation inputs are optimised. Relying on soil moisture monitoring alone can result in too much, or not enough water being applied unless monitoring devices are perfectly situated and the results are properly interpreted. A water budget should not take the place of soil moisture monitoring. Instead it verifies that monitoring results reflect the expected irrigation requirements for a given period, based on the net movement of water entering and leaving the growing system i.e. water entering as either rainfall or irrigation and water leaving via evapotranspiration. Soil moisture monitoring in spring will determine when irrigation needs to start, based on the soil water deficit and how much water is available to plants. Water budgeting begins at this point and is used to estimate how much irrigation water will need to be applied in the days ahead i.e. the irrigation schedule. Regular soil moisture readings should then be used to verify or ‘fine tune’ the irrigation schedule, ideally on a block by block basis. An appropriate crop factor must be used to calculate evapotranspiration (ET) for your crop, reflecting the amount of water likely to be lost from the growing system. Research suggests that mature apple and pear trees typically have a crop factor of 0.7 or 70 per cent of reference evapotranspiration (ETo). Because apple fruit sizing continues at a fairly steady rate from about 6-7 weeks after budburst right through to harvest, the crop factor changes little until after harvest when the trees’ water requirements reduce. Crop factors do vary depending on irrigation system design (e.g. drippers versus sprinklers), leaf area density, tree size and planting arrangement, so growers should seek advice if they are unsure what crop factor to use. Dr Ian Goodwin and Anne Maree Boland have both presented to Future Orchards on this subject so please review their notes, which are available on the APAL website. Both ET and rainfall are measured as mm and are publicly available nationwide through the Bureau of Meteorology (BOM) website and other sources. Whilst there are extensive weather station networks across Australia, rainfall can be very localised so monitoring rainfall on your own property will ensure your water budget is as accurate as possible. Because ET is less variable than rainfall, the ET values recorded at your nearest BOM monitoring site will be fine in most cases. Daily reference ET or ETo for your local area can be found on the BoM website. Irrigation applied can be calculated by dividing the irrigation output per sprinkler/dripper by the surface area covered per sprinkler as in the following example. Example 1: Mini sprinklers every fifth tree. Row spacing 4.5m, tree spacing 0.75m. OrchardNet is an online system designed to capture critical orchard data and help the manger analyse and improve orchard performance. Using OrchardNet managers can now compare the effect of water use and crop factor on production and profitability. 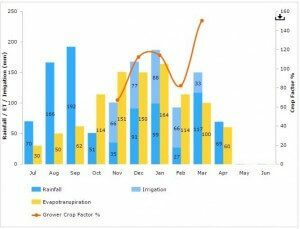 One reporting option compares the irrigation applied, rainfall and evapotranspiration to calculate a crop factor for those months during which irrigation was applied. This is a useful reference for easily comparing irrigation inputs against predicted requirements of the crop. The average crop factor for your crop (e.g. apples) and location are also calculated and reported for comparison. OrchardNet subscription is part of the Future Orchards program for apple and pear growers in Australia – contact APAL or AgFirst to get your account set up if you do not already have one. Three case studies are summarised below to provide examples of optimal irrigation management, and irrigation that has compromised the size and/or quality of the crop that season. 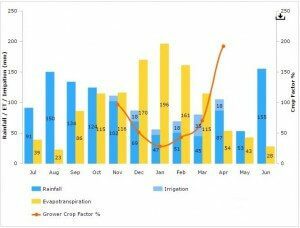 These examples have been chosen to demonstrate the value of a water budget for management of the current season’s crop, but also to help plan for future irrigation requirements. Graph 1: Optimal irrigation on a Cripps Pink block. This Cripps Pink block produced over 99 tonnes/ha with an average fruit size of 172 grams and received only 153mm of rainfall between October and March inclusive. The crop factor increased from 40 per cent early in the season to 60 per cent in November and 70 per cent in December. Good rainfall in January saw the crop factor increase to 125 per cent, which allowed the soil to refill to capacity and less irrigation was required in February. With only a small amount of rainfall in March, irrigation increased accordingly and the crop factor increased to 83 per cent to ensure fruit continued to size. Along with a water budget, soil moisture monitoring was used to measure change in the soil water content at weekly intervals throughout the season. An excellent example of good irrigation management. Graph 2: Not enough irrigation on a Gala block. This orchard had insufficient water to meet irrigation requirements in the 2014 season. Good amounts of water were applied in November when water was available to ensure soils were at full capacity going into the drier months, but later in the season water was severely restricted. The calculated crop factor for the period between December and March dropped to between 27 and 51 per cent, significantly less than the amount required to meet the demands of the growing crop. Gross production dropped from 43 tonne/ha the previous season to just 28 tonne/ha and average fruit size dropped from 160 to 141 gms. This grower knows that he was under watering the crop and is now investigating options to increase his ability to store water. Using a water budget alongside this, he can determine how much additional water he needs to meet irrigation requirements in a dry year. Graph 3: Too much irrigation on a Fuji block. Irrigation inputs for this orchard were based on a newly launched irrigation tool that had not been well tested for use on apple and pear crops. Soil moisture monitoring was not carried out and a water budget was not used to cross reference the recommendations provided, resulting in significant over-irrigation of the crop. 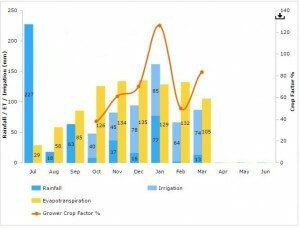 Graph 3 from OrchardNet shows that the crop factor (calculated retrospectively) was equivalent to 67 per cent in November and rose to 112 per cent in December and 114 per cent in January before dropping to 87 per cent in February. Yield and average fruit size for the block were on target, but fruit dry matter and colour were both poor resulting in reduced fruit value. In addition to this immediate impact on profitability, continued over-watering is likely to reduce potential yield and fruit quality as a result of declining root health and increased sensitivity to environmental stress. The risks associated with over-watering, versus under-watering should be considered equally important when preparing a water budget. We encourage all growers to review their irrigation regime for the past season. By doing this, and understanding the material provided by Future Orchards, we hope there can be a real improvement in the understanding and application of irrigation management in the future.